Each week I have several mornings while my daughter is at preschool and my older son is at elementary school and I have my toddler all to myself! Usually we catch up on errands and chores, but we also like to stop and do some projects together. 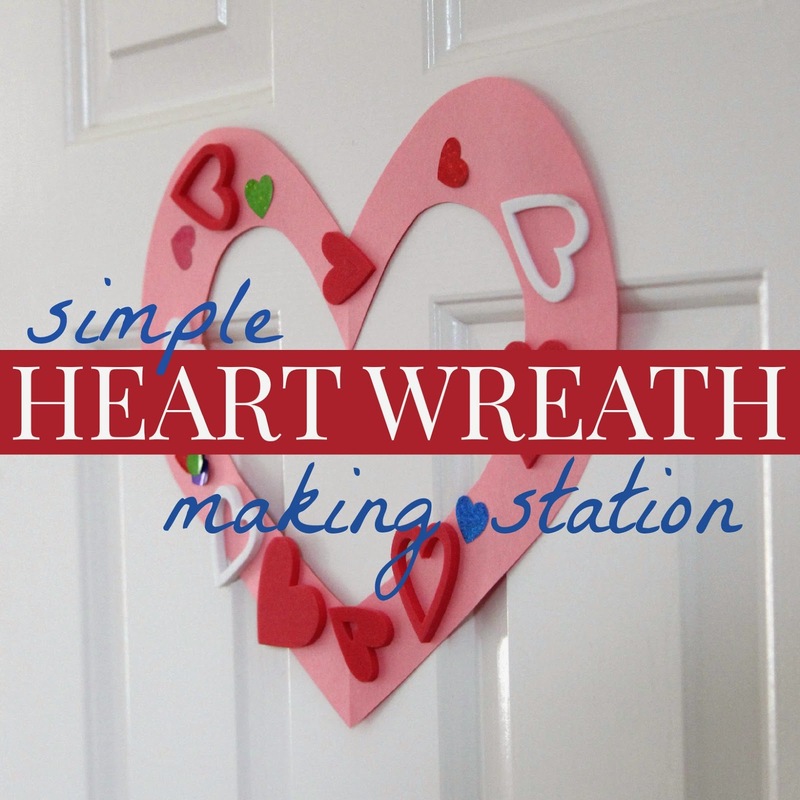 This week we decided to set up our own heart wreath making station to get our house decorated for Valentine's Day. 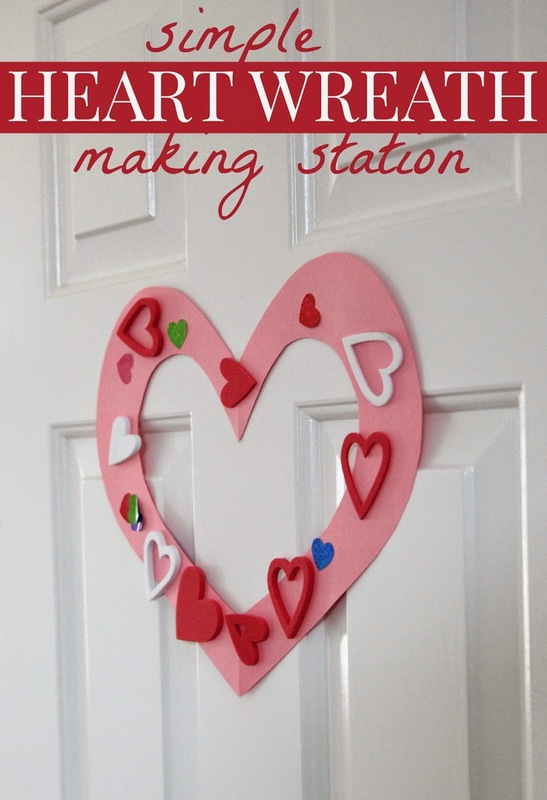 This is probably the simplest Valentine's Day project you can do with your toddler and we loved it! See! I said it was easy! You could also use glue to add other items like pom poms or sequins or just use markers or crayons to add some colors. What would your toddler want to add? Once all of the materials were set out we got started sticking things on our heart wreaths. To help my toddler be more independent with stickers, I pulled some of them off for him and lined them along the table. This way he still used his fingers to pull them off and place them where he wanted but he could do that independently. As kids get older and are still learning to use stickers I will just help pull the stickers up partway for them and then let them do the rest. We both enjoyed talking about the colors on our wreaths and where we wanted to put things. This activity was such a sweet connecting activity that allowed for a lot of language building conversation as we talked about position words (on top, under, on the bottom, etc) and we talked about the sizes of the hearts. Once we were done we hung out wreaths on the doors to our kitchen and then we checked out three of our new books. Along with our heart wreath making activity we checked out these new-to-us books that Harper Collins sent us! We love Amelia Bedelia! She is funny. This book has darling illustrations that are fun to look at with toddlers while the text is more appropriate for pre-k children. Amelia Bedelia takes things very literally and the humor is lost on kids that are too young. The story is about Amelia Bedelia's first Valentine's Day and several of the mishaps that occured. It has a sweet message at the end as well. This is a sweet rhyming book featuring a fox and a bird. The text is very simple and the pictures are beautiful. I thought the book was just lovely, short, and reading it just made us feel happy. The kids loved that the Berentain Bears book included stickers AND valentines. Berentain Bears books are typically more appropriate for preschoolers and pre-k kids since there is a lot of text. My toddler enjoyed looking through the pictures with me while I told him a modified version of the story. Disclosure: Harper Collins sent us these books for free to review. All opinions are mine.